It’s good to be back again in the company of Don and Rosie and the next instalment in their lives. This sequel is just as humerous and heart-warming as the first. I reviewed The Rosie Project here if you’re interested in checking that out. A thoroughly delightful read that will particularly appeal to anyone that grew up in the 1970s and 80s…reminiscent of my own childhood. A book that you long to savour but can’t help devouring. I met Leigh recently at an author / blogger meet up in London and she offered me her book for review. I’m expecting this to be a lot darker than my usual crime thriller reads but I’ll give it a go. This is the first in her DI Geraldine Steel mystery series. I got the Rosie Project from the library a few months ago but somehow never got around to reading and ended up having to return it. I think I just wasn’t sure about it and kept putting it off. Maybe I should give it another try. So far so good…it doesn’t quite have the unexpected humour that came with The Rosie Project as I’m now expecting that from Don but still a fun read! I’m enjoying it so far but you’re right, it doesn’t have quite the same impact. I think I’m going to have to buy The Trouble with Goats and Sheep for my Kindle as I’m still struggling to hold my hardback edition. I was a child in the 80s so I’m sure this book will resonate with me a lot too. I’m glad you enjoyed reading it. I haven’t read any of Leigh Russell’s books but this one sound good, I’ll look forward to reading your review once you’ve read it. Hope you have a great week! I’ve never read anything by Leigh Russell yet but definitely seems like my thing, I like dark crime. I’m interested to know what you think. Hopefully I will have an update for you next week. I don’t like crime novels that are overly graphic, that play on my mind or keep me awake! I hope you enjoy the Leigh Russell. I have the copy of her new crossover book safely stashed upstairs and I’m working my way towards it as quickly as I can. Probably not as a group as one member has already read it, as have I and there are only 5 of us. Would make a really good book club choice though wouldn’t it, given the conversation we had after it! Maybe she would come to my library which is on the same street where I live! Yeah I saw that about JK…I don’t think I could have spoken to her and I’m not even a Potterhead lol! I have the Rosie Project on my shelf but haven’t read it yet. I’m sure I will at some point though! I really recommend The Rosie Project; especially as you liked Shtum and this is a kind of lighter-hearted take on mental illness (not that I’m trying to belittle it in any way!). 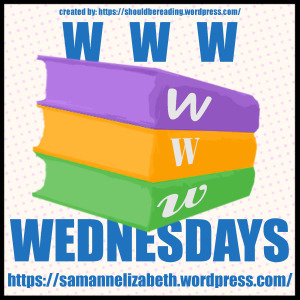 Good to see you’re continuing with Rosie – although I enjoyed this second novel I much preferred The Rosie Project – thanks for visiting my Wednesday post earlier. I am really enjoying it but I agree The Rosie Project was probably the better of the 2. I still have to read The Rosie Project, hopefully some time this year… It sounds like an interesting read though. Cut Short looks really intriguing as well; I hope you’ll enjoy your books this week!